Strengths of "Managing Migraine: A Healthcare Professional's Guide to Collaborative Migraine Care:"
• Written by doctors for doctors. • Written by doctors who are very well qualified to address this topic. • Suggested reading at the end of each chapter. • Bibliography is broken down by chapter, allowing additional reading if wanted. • Teaching points are broken out into boxes for easy review. • The tools for follow-up in Appendix 1 are excellent and can be edited to be used at both the initial visit and follow-ups. • Learning Early Intervention, Appendix 2, is an emerging topic now, and this section should prove quite helpful. It isn't often that four experts collaborate on a book. Doctors and patients alike are fortunate that these authors did. For the doctor who has not had the time to extensively research Migraine, but would like to be better equipped to help the Migraineurs in his or her practice, this book will be quite valuable. Combined with "Managing Migraine: A Patient's Guide to Successful Migraine Care" in the patients' hands, the combination will be priceless. For patients: If you're working with a doctor you like, and that doctor wants to treat you, but is at a loss as to how, this book could be a great tool for both of you. This book -- and the companion book for patients, "Managing Migraine: A Patient's Guide to Successful Migraine Care" -- are books I wish had been available ten years ago when I was desperately seeking help. 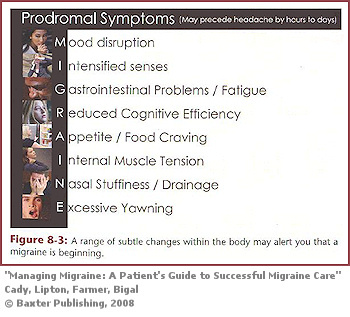 For a review of "Managing Migraine: A Patient's Guide to Successful Migraine Care," click HERE. 1 Cady, Roger K., MD; Lipton, Richard B., MD; Farmer, Kathleen, PhD; Bigal, Marcelo E., MD, PhD. "Managing Migraine: A Healthcare Professional's Guide to Collaborative Migraine Care." Baxter Publishing. Hamilton, Ontario. 2008. 2 Interview with Dr. Roger K. Cady. Teri Robert. August 16, 2009. 3 Interview with Dr. Richard B. Lipton. Teri Robert. August 14, 2009.